Notes from a son: Dad took things personally. There was no larger view of war, no “I’m one of millions fighting for a greater cause” B.S. They were dropping bombs on him, not the U.S. Army, and they were going to get it. In this section of his journal he learns that a friend from Detroit was killed in the Pacific, and his reaction was a vow of vengeance to come. He also expresses disgust at rumors of U.S. Marines killing prisoners on Guadalcanal. This was before Dad saw anything more than air raids and uneventful combat patrols. He was just named P & D (Pioneer and Demolition) Corporal. He’d never heard the peculiar buzzing of hot lead passing close to one’s head, seen comrades fall, been under enemy fire, and emerged from an LST into the unknown. Listened to Tokyo, Japan’s English radio broadcast. Announcers speak very good English, especially the one on Zero Hour. He’s perfect. News a direct contradiction to ours, very amusing. Zero Hour is meant to break our morale, in between suggestions about our girls back home they sure play swell jazz. Beautiful moonlite nights, but dangerous because Japs seem to think so, too. Getting lots of mail from all over. Pretty nice. Palm Sunday, April 18 – woke up to hear the damn bugle blaring away. New order came through for bugles, Etc… Going into garrison life, so maybe we won’t be bothered by the Japs for a while. I hope we don’t have to go looking for them again. Palm Sunday not so good – 7 air raids after dark. Hear we’re moving to a new area. Was to police coconuts half day Wed. New area O.K>, looks good but we sure will have plenty of work moving. Went past American soldiers graveyard. Sure was a funny feeling to think tomorrow you might be under one of those white crosses. Found movie place back of area. Pretty lucky. Our new will be on a point surrounded by water on both sides near radio warning system. Worked G-2 all day on bomb shelter. Everyone mad at Japs killing aviators that bombed Tokyo. Americans took Ellice Isles near Gilbert Isles. Coconut crushed Marine’s head when it fell from tree. More dangerous than the Jap bombs. Still having air raids, but no one seems to care anymore. Was watching swell movie, “A Man to Remember” when about ¾ thru Japs interrupted. Now I’ll never know how it ended. New area cleaned, dug garbage pit. Moved to new area Wednesday. Soon as we took tents down it really rained, got soaked then was wet all day. Was helping Shan move things and made 6 trips altogether. Was really tired at nite. Came back in nite with no lights on. Have swell view of ocean and cool breezes keep coming in day and nite. Rumor has it we’re shoving off in 6 weeks. Another rumor: Gen. Wing has a bet we’re home in July. I hope to God he’s right for once. Mail coming in Swell but have no time to answer except to Mom. Pat still allergic to writing. Payday April 30: $133.20. Sending $20 home when Tenelli gets money order. Old Rommel getting his seat hot in Tunisia. 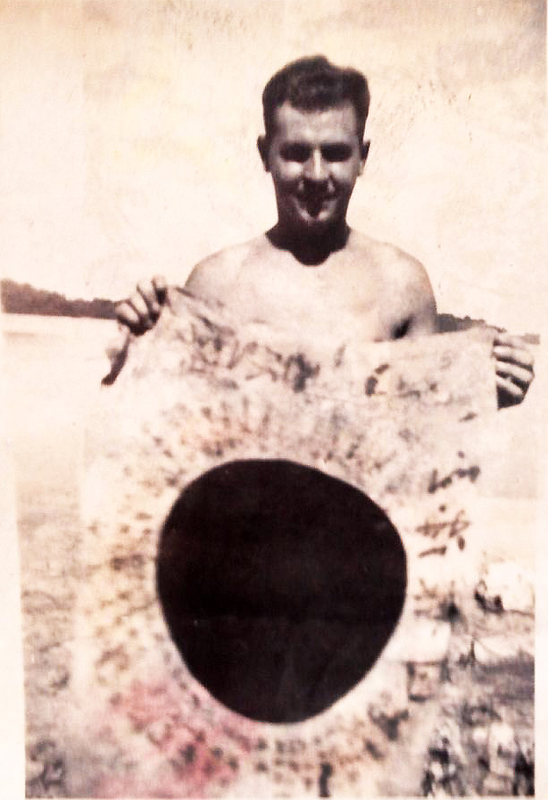 Made news Easter Sunday when Japs came over at noon, our planes beat the hell out of the Zeros. Woke up last night and heard a hell of a racket. Japs came over and bombed somewhere. Just so they miss us, I won’t care. Started to build bomb shelter to hold 20 men. Hard digging in coral. Saw Ernie Ladas photo in Times killed in Pacific area. Someday the Japs will pay in full, believe me. Still on bomb shelter. Been using jackhammer and fingers are really sore. Got two nice burns. Received mail and a Christmas package from the Lutheran minister Zulay. Toilet articles he sent sure came in handy. Candy melted over everything. Everything quiet lately, news from Africa very good. Rommel concedes defeat to our troops. Now Europe’s next. Hear rumors of going back to U.S., or ahead to New Georgia, then relief for us that’s left. Had four consecutive air raids last nite. Ack –ack fire looks pretty at nite. No mail for 9 days then 21 at once. Had to go on recon to Alacon Isle to investigate smoke seen. The source of the smoke was a tree hit by a 155 m.m. shell. Nice trip in ocean on Higgins boat. Saw fish of all sizes and shapes. Tried to hit’em with boat hook, but no dice. 2nd Division returned to area from Pe(illegible). May mean something. Going for H2O with Shan most every day. Boy our roads are something to see. Can see Guadalcanal very good from here. 37m.m. taken by platoon to point to guard cove. Had target practice on 37 m.m. about 9 rds. A.P. one round canister. Gun needs bore sighting, a little off. Sgt. Marcotte got a direct appointment, now known as Lt. Marcotte. Mike Lajoie getting the works, had a summary court martial, paid a fine, and now he’s to be confined two months in guard house. And all for a silly thing that could have easily been overlooked. Had quite a few bombings, last night was the worst. Had three raids, and the ack-ack was terrific. Had shrapnel falling all over, and boy they’re really mean looking. No one hurt. No one hit by shrapnel and bombs, but two (Illegible, looks like bulls) got killed and lots of cows are dead. This damn full moon is really raising hell with us. Have a couple of bombings every nite, some fun. Ur big bomb shelters sure are nice to get in. Some ack-ack fire hit Jap bomber and what a pretty picture that made when it exploded in mid-air. Friday had a problem firing all our weapons. Had my 37 and got direct hits on target with A.P. Cannister shot really mowed down the bushes. My Tommy gun was really hot when I got through, fired 180 rounds in a little over a minute. Two fellows hurt when hand grenades went off. Not too serious. Sat. had to blow up dud mortar shells, 81m.m. Sure is a ticklish business, but being in a demolition squad, that’s our job. Hear rumor of me getting transferred to 1st Platoon in charge of P and D, Means a Cpl.’s rating but I have my doubts. I’m not the one to get any breaks. So far, I’ve been getting it but good. American Forces captured Attu. Japs must be jittery, and old Shicklegruber probably got a fit. Sunday: Big event on my army career. Have K.P. for the first time since my induction. Not bad, stayed clear of it over a year. Went to relieve 1st Platoon outpost on 37 m.m. at P-T Base. Had guard only one day. Had to move back to camp equipment and all. Something seems to be brewing. 103rd Infantry back in Guadalcanal. Effective June 1, I’m to be P&d Corporal. I hope I can do what’s expected of me. First detail I had was to get a log 30’ long. Men seem to be satisfied, all but one, and he’s liable to be picking up his teeth any day now. Went for log down Water Hole NO. 3 way past Blue Beach. Saw two observation planes take off airport. Lots of British Spitfires on landing strip. Probably indicates that British will take over here, and we’ll go ahead. Getting hard exercises for one hour per day, and getting a lot harder daily. Can’t say the same for myself. Pap and Newman out on search for Japs. Being a non-com prevents my going along. SO far we’ve always been together, hope it stays that way. Getting all kinds of jungle equipment, so we’re due for a push. Probable places San Isabel or New Georgia, could be Recarta Bay, too. Oh well. Maybe after we chase the Japs off, those that are left will get a rest in some civilized place. Saw a sailor getting buried in our cemetery. Getting mighty popular lately. No trouble from Japs in over a week, thank God. Was notified by Anderson from here on I’m officially a non-com. Had one sweet time this morning. Had to go on a patrol. Net results a good wetting and not a dry stitch on any of us, really rained. Everyone tired. Sure had some time cleaning my Tommy. Pap and Newman still out. Wonder what’s up. Been getting the true story of our glory-grabbing Marines. The Army chased the Japs off Guadalcanal but they hogged the glory. Carlson’s Raiders were really nothing but butchers. Found 400 Japs in a hospital including one high-ranking officer. Murdered every one of them instead of taking prisoners. Army has no use at all for Marines and we seldom hesitate to tell’em in plain English. They get beer, candy and popular brands of smokes while here the boys get nothing but Chelsea cigarettes. Seems to me we’re getting the works. But every dog has his day. Ours is coming. “The Japanese were pulling back, recoiling like a hand from a flame. 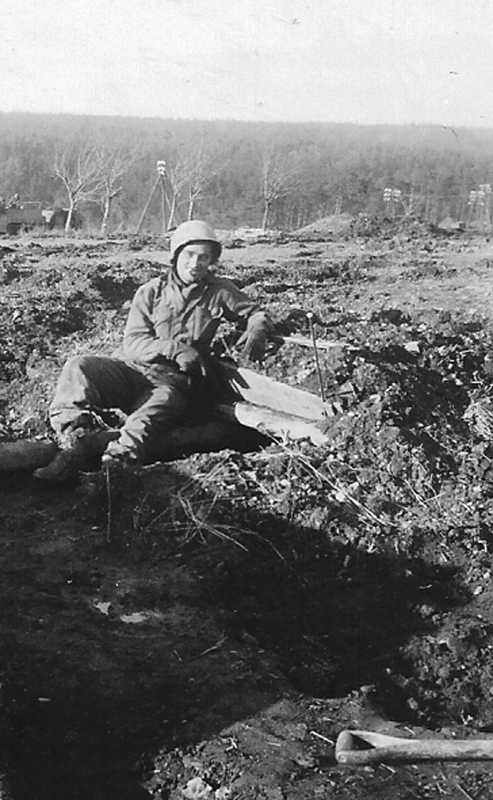 Carlson’s men were doggedly pursuing them, whittling away at what was left of the 230th Infantry Regiment. 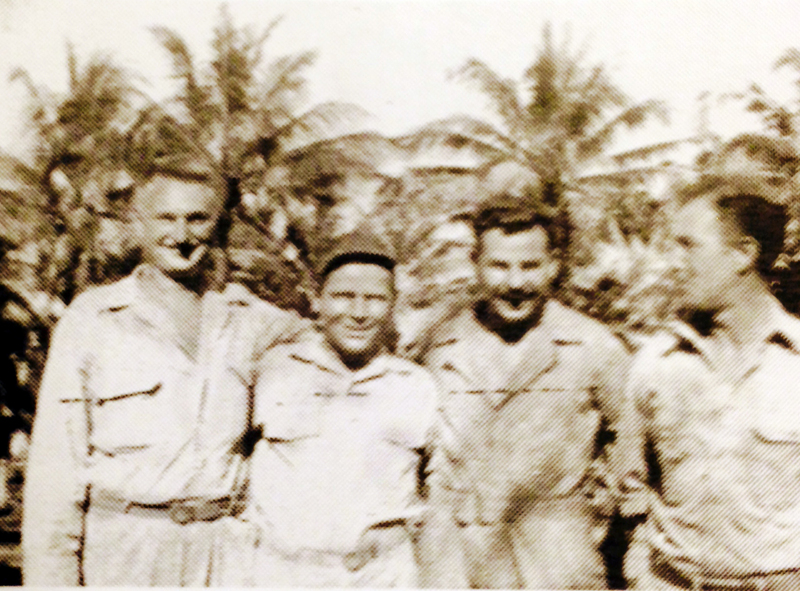 On Nov. 12, SgtMaj Vouza led a war party of natives and Raiders along barely perceptible native jungle trails near Asimana. a village on the upper Metapona River. From the river came the sound of splashing and men laughing. The Marines and natives smiled at each other. This was going to be almost too easy. A company-sized force of Japanese had taken the time to refresh themselves in the river and bathe. For the Japanese, bathing is more than a cleansing of the body, it is a social ritual of pleasure and relaxation. It must have been too tempting even for officers and noncommissioned officers who should have known better, for those men, too, were naked in the water, temporarily forgetting about the horrors of war. Even their pickets were too busy watching the bathers to hear Carlson’s men silently surround them. The last sounds they heard were the explosions of grenades, the slap of bullets and their own screams. The massacre turned the river red in less than a few minutes. No one survived and 120 bodies, white except for their infantrymen’s tan, dotted the shoreline or drifted pathetically on the water. Back to the journal, where the invasion preparations are going strong, and the guys are passing around wild stories to pass the time:Heard two reports of how native girls marry in San Isabel, use “cats eye” shells for money on the island, so before marriage a girl goes out on the island and sells her body to men. Idea being the one who has the most shells must be the most desirable, so she gets her choice. Another cute custom around here is the best looking virgin gal is called the “Belle of the island,” but she can be bought for 12 pounds cash or two pigs. Wonder how come we never hit such a place. In my spare time I’m going shell-hunting for the cat’s eye variety. Having an awful lot of rain. No more radio news, scout cars turned in. Believe we’re soon on our way up. For some of us it may be our last trip. Morale of troop is very high, can’t say the same for yours truly. Mail O.K. Some even get parcels. Seeing as how everything is rationed I haven’t the heart to ask anything of Mom or the rest. Getting lots of classes on everything. Really toughening us up. Even have to swim a lot, one subject we all like. Heard some men were already on the way to New Georgia. We’re due to get going any day now. Have very bad gash on leg and cuts all over my hand. Fell on coral. Boy, it’s razor sharp. Had a raid by Jap planes Sat. One young fellow in a Grumman Wildcat had to hit the water about 150 yards offshore. Plane sank immediately. Pilot O.K. Guess he’ll live to die another day. He was confused. He thought we were Japs on the bank. When we waved he said it was his happiest moment. Been shooting .50 cal machine gun Saturday afternoon, me, Pap and Sam. Sunday wrote letters before noon, after noon fired .03 and Tommy gun. Shell blew up in Tommy and darn near knocked my head off. Fired about 150 rounds of .30 cal. Not bad. Had U.S.O. show Friday afternoon. Hollywood actor Jim Burke, a magician and Bob Gilchrest the singer. Pretty good. Saw movie “Stage Door Canteen.” Not too good, anyway it was a bit better than nothing. Next week should see a few changes. He was 61 then, and 24 when he wrote this account of World War II in the Pacific. Clearly, the older version of my Dad would have smacked his younger self for complaining about officers the way he did in this journal. A little research did indicate that the General Hester he sometimes complains about was relieved of command after this campaign for getting bogged down, and he never had another combat assignment. And he’s no fan of commissioned officers for the most part. This entry period, the time just before the New Georgia invasion, is below. Repainted 37 and helped dig garbage pit. Had most of Saturday afternoon off. Eight men transferred to H.Q from second platoon, Little Red, Cook and Strife. Going out on a mission tomorrow morning to capture Jap radio system in jungle. Had one swell time going through jungle. Everyone was exhausted, but not even a trace of Japs. Found one Parker pencil in gun emplacement. Saw two movies, “Prison Farm” and “Saints double trouble.” Shows how much we care for Japs when they have large concentrations on New Georgia only 30 miles away. Plenty of Japs overhead flying at all hours. Washboard Charlie came over at 4:35 Wed. morning and we were up at 4:30 so he got screwed this time. Got paid $33.20, mail call, letters and about a bushel of papers. Had a swell raid before noon. 5 Japs down, 1 of ours lost. Pilot bailed out safe. Sure hit the dirt when one dived at us, got hot reception our .50 cals. Later found out it was one of our Grummans. Heard G-2 radio report of actual dogfights from pilots. Some fun. Right now, April 1, 12:30 noon, we’re seeing one hell of a dog fight, there are planes all over us, the whole damn skies are full of them diving all over the place. Motors whining and their machineguns really making a racket. One now going down in flames. All are cheering here. This is really like a movie scene. Seems hard to believe. Wonder if Benaki will hit the news tonight. Watching this sitting by my foxhole. If I had to get in I’d sure get wet. The damn thing is half full of water. April Fools Day really came in nice, saw a double feature already. Wonder what Mom would say if she knew where her Sonny was, 35 miles ahead of Guadalcanal, closest outpost to New Georgia. Only the Navy and Japs know we’re here. Sure have lots of rain lately, mud ankle deep and a cement pavement here would be next thing to heaven. Heard some G-2 stuff form a Lt. at H.Q. During the second air battle we saw 5 Jap Zeros on the tail of a P-38. The pilot was heard to scream thru radio, “They got me Russ!” They did, as was later verified. If anyone tells me the Jap Zeros are no good there’ll be a murder committed. They can out-climb anything we have. Air raid again 10:30 Sat. morning. Listening via radio to pilots up above. Using all kinds of code words. The flight C.O. is called Knuckle-head. One of the planes reporting leak in gas line, ordered back to Henderson Field, Guadalcanal. Starting out on mission to other islands for four-day search for Jap radio. Should be fun living with ants, scorpions, spiders, crabs, flye frogs and even alligators. One of the pilots just reported, “This God-damned thing is starting to sound like a threshing machine. Marched to beach and loaded our things on Higgins boats. Was supposed to land on small isle next to one where Japs are, but no place to land so we landed on Takina Isle, the place where we’re supposed to find the Jap radios. Me, Pap, Mike and Newman built shelter with four shelter halfs and leaves to sleep on. Rained like hell all nite. Damned the one who made the shelter halfs. All they do is strain the rain into smaller drops. Somebody’s sure making money out of this war. No Japs. Had jungle rations for supper, very good cans of meat, cheese, powdered milk, sugar coffee, cocoa, cigarettes, crackers, candy, peanuts, gum and even dried fruit. Only trouble was we had to split it 8 ways. Our “C” Rations are lousy. Hash, stew or meat and beans. Other can has dog biscuits, sugar, simulated coffee, “D” rations one candy bar. 600 calories one meal. Searched Isle again Monday, same result and soaked again at nite. Tuesday walked over hell and back, found one bivouac area recently evacuated, probably by Malta troopers. Got jungle hammocks to sleep in, sure are tricky. Shanahan fell out twice. Have ample protection now, so no rain. Got 16 letters Wed. Have plenty of cuts and bruises already. Climbed a cliff yesterday that was a honey. Got very warm and (illegible) so stayed behind today. Left for camp 2:20 during one swell air raid while we were on open water. Had ack-ack fire over our heads, watched dogfights most of the way over. Hiked back to camp. Sure felt great to wash up and put on clean clothes. Mike killed one snake and IU saw two big lizards 3 feet long. Toads kept us awake there with their singing. To sum it all up it was hell and our Capt. Didn’t help matters a bit. On alert. Rumor has it the Japs are going to launch an attack on Benaki. What a Welcome they’ll get. Japs disappointed us, thank God. Officers made our platoon build them a shower. I hope someone fills it with tar. Sunday, still no mail from Guadalcanal, 7 of us in a tent now laying around and arguing. Got Jeff Mernet, Pap, me on one side, Mike Newman, Shanahan on the other. Argued about “Care of Babies” last nite. Having 2-3 air raid alerts every nite, getting used to it now. Two radio men had a dream and saw what they called a Jap prowling by officer’s latrine. As result we now have 18-man guard 2 hours on & off. Sure is the nuts. Pvt. 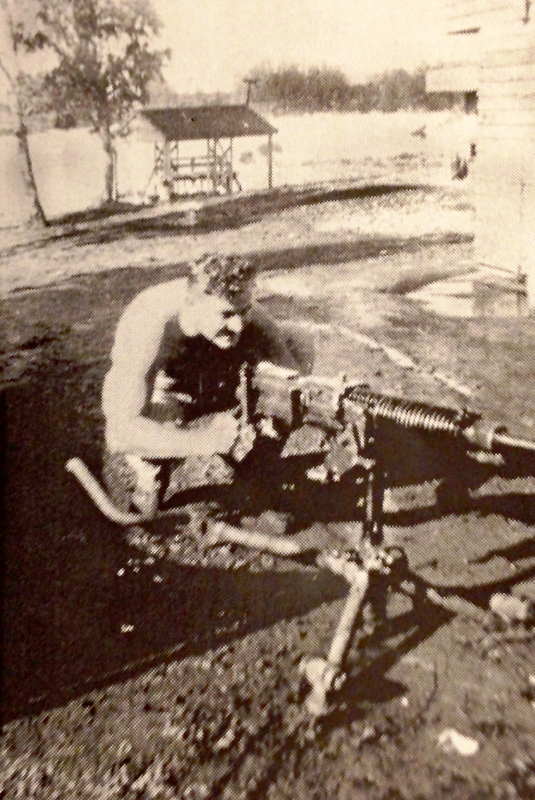 John Steve Moses, 26, poses with a machine gun on an unknown South Pacific island. The following is Part IV of a verbatim transcription of a journal my father kept during World War II while serving in the U.S. Army’s 43rd Cavalry as a Recon Trooper in the Pacific Theater. Left camp about suppertime in trucks for Noumea, arrived about 10 and immediately got on Higgins Boat and was taken to S.S. President Hayes. Had to climb up landing nets and that with all equipment. That’s one climb to remember. Got bunks just above water level. Hot as hell down there and just as crowded. The Hayes is a new ship and looks pretty fair. Got on board Feb. 12 but didn’t sail until the 15th. Had a detail to break out food for the trip. Kind of tough, but we had plenty to eat extra. First day we got 5 gallons of ice cream. That alone was O.K., but that was all we got because every noncom we had got wind of it and the steward said no more, so that ended our ice cream. Banana flavor, too. Had a few practice drills for abandoning ship. The rest of the boys had to climb up and down landing nets. Such cussing I never heard. Us boys on detail somehow managed to get away without joining them, even if Lt. Atkinson tried his darndest to make us. Poor Ack-Ack. Nobody seems to mind him. Sighted San Christophe Isle after noon Feb. 17. From here on the waters are known as Torpedo Junction by the sailors. Lighted by a few flares around us. No one seemed to know where they came from and saw signal lights off the coast. Then came the alarm. Our convoy, consisting of 6 destroyers, the President Hayes, Adams, Jackson and Crescent City, the (illegible) was being attacked by Jap torpedo planes. Tracers from the 20 m.m’s really lighted up their planes. Our ship, the Hayes, was lucky, they got three planes, the rest got two out of 7, so the final score was 5 out of 7 and no losses on our side. Don’t know now whether I was scared or not, but a few bombs did drop awfully close. Japs then turned tail and scrammed. Slept up on deck rest of the nite. Saw Guadalcanal in the morning, lots of coconut trees and jungle. Landed by Higgins Boats on the 18th. Had a busy day unloading and sorting our supplies. Was really tired when nite came, ate C rations all day. Can see Florida Islands from here. Slept on ground and got soaked proper, everything wet in morning. In morning loaded our stuff on Higgins Boat to move up the beach again. Unloaded about 10 miles up the beach near Henderson Field. Had to move stuff three times because of the damn tide coming in. Lots of Marines here. Saw one with a long Jap sword and another with a pistol. Not bad. Had to load up again on big Barge No. 323, the Omaha. 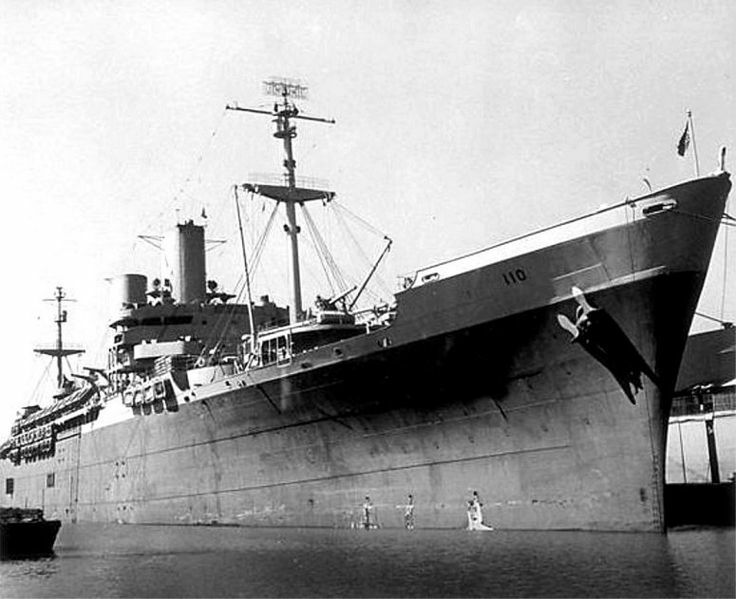 Sure is big, and can carry plenty, had all our vehicles on board and tons of stuff besides about 250 men. Slept in tent with Marines overnight, one gave me his own blanket and he was cold all nite. Slept on the floor and damn glad of it, outside it rained all nite. Slept next to Lt. Barnett. Sailed off to another place, anchored right off Tulagi all day in a hot sun. Swam in 200 feet of water and enjoyed it. Our Capt. Dall swims like a fish. 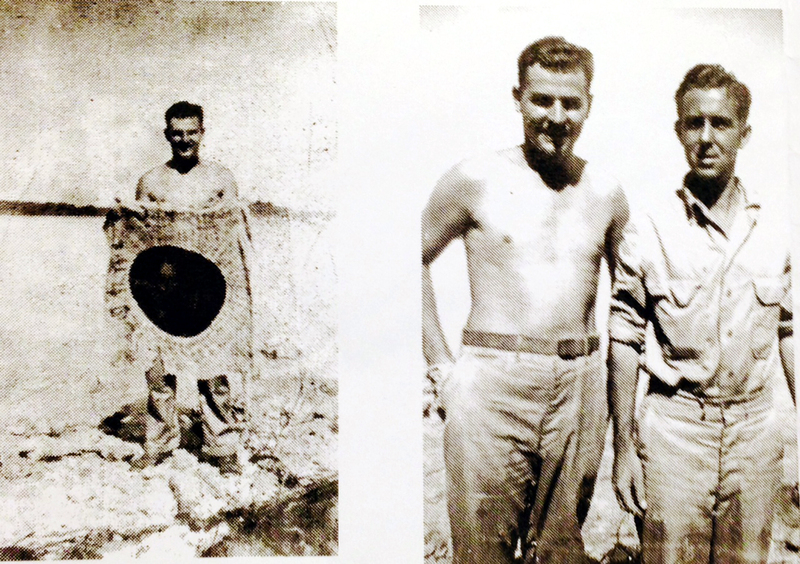 Started off about 9 o’clock on Feb. 20 for the Russell Islands, Third Platoon on another boat. Had 4 hour .50 caliber machine gun guard in a down pour. I cussed everything and everybody in sight. Later heard Tulagi was bombed the same nite we left. Arrived on Banika Isle of the Russell group. Nothing but coconut groves all over with a little two-by-4 jungle. Our Camp site is right by the jungle line. There are millions of flys here on the coconut trees. Place is owned by Lever Bros. soap company. If you ask my opinion, they can have it. Have coconuts here galore. Tired of eating them and drinking their milk. Water is scarce. Have to dig wells, for no streams. Celebrated my birth day in the army, 26 on Feb. 26. Wonder where my 27th will be spent. Date of arrival here was the 20th. Rumor has it 1500 Japs evacuated just before we got here. Pier is bomb wrecked but so far everything’s peace ful here in February. Mail is coming thru, but no more parcels. Congress doesn’t believe we soldiers deserve anything from home. All we’re giving them is our life. Finally got our place looking swell, policed-up coconuts and have our fox holes dug in case of an air raid. Listen to the radio on scout car every nite. News very good for our side. 3rd Platoon moved out with the 169th Infantry, so now we’re in three places at once. 3rd on Pavuvu Isle and H.Q. and 1st on Guadalcanal. Best news of Pacific War yet. On March 3, our air force destroyed 12 Jap transports, 8 destroyers and 102 planes. We lost one bomber and three fighters. Our convoy being bombed was in the news twice already. March 6 we had our first taste of bombs. Don’t know how many came over but 7 never returned, met their ancestors in a hell of a hurry. A few of the bombs came too damn close for comfort. Since then we’ve had raids about 3 times a day. And in the middle of the night it’s not exactly fun getting bombed. On the 10th we had a peach of a raid, saw a Zero get hit by only 3 bursts of a p-38 and it hit the ocean. Knocked down quite a few. Had to stand guard 2 hours last nite, 2 Jap pilots on island. At dawn we searched the jungle with no luck. The Navy finally got both. And walking thru that damn jungle is no picnic, so thick you can’t see 10 feet to either side or ahead. Full of big lizards, spiders and big swamps. March 14 the 1st Platoon finally got in from Guadalcanal, and they sure brought some rain with them. Now we can go out and wash our clothes. Due to shortage of water here we have to catch rain water in cans and in shelter halfs to wash in. Have about 200 gallons now. Engineers drill for drinking water. Not bad. Damn Japs flew over us three times at exactly 8 o’clock and ruined our listening to the 15 minute news broadcasts from Frisco. We use one of the scout car radios. Reception very good. Sure sounds good to hear from the states. Got two packages, one from Elaine and form Lizzie. Mom wrote Julius (Moses, Dad’s younger brother) is in (the service) from Feb. 11, 43 and that Pat’s in the WAACS. March 15 H.Q. came in, now we’re all here and everything’s being reorganized by the looeys. So far they’re leaving us alone. Got paid $33.20 for Feb. Can’t spend money here except at the P.X. for candy. Got two more packages, Lizzy again and Mom. Have quiet here lately, only 1 alert, but these parrots here are aping our signals and we are having a devil of a time telling them from ours. Two whistles mean Jap planes over Solomon area, three means planes over island. English left in such a hurry all their cattle was left behind. Never saw such thin, scrawny cows and calfs. Shot one and ate it. Meat very tough. Gen. Hester heard about it. Now we stop eating meat, and he probably starts to. Just now been informed of my second I.Q. I took in New Caledonia, final score 131, now Andy’s only got me beat by 1 point. Got some cookies from Mom, kind of crushed but made quite a hit with the boys and me. Sent $50 home. No raids lately because of the full moon. Still policing up coconuts of all the screwy things to do. So far we’ve picked up a few million, usually pile them up, and one day we’ll never forget we had orders to pour gas on them and burn it. Really made a nice smoke, and probably was the cause for our first air raid. Had a court martial about 150 feet from our tent, 3 privates, went thru all the usual pomp and ceremony but the all-officer jury probably knew the verdict before hand. Some of the boys coming down with malaria and a few other diseases common to the tropics. Had a taste of malaria week after we hit Russell Islands. Took enough Atabrine to cure an elephant. Take half of an Atabrine pill every nite. Was to get water with Shan and like a dope dropped the water trailer on my left hand. Got deep gash but no bones broken. Better luck next time. Have loudspeakers in trees for us to hear the radio nites, becoming a regular ritual. Everybody listens to news casts and argues about it later. I say the war will end in July. Of course, there are disbelievers all over. Had two more air raids last nite, getting so a fellow can’t get a good nite’s sleep anymore. Got good and wet when Shan and I went past Blue Beach for water. Roads very muddy and slippery, hit two coconut trees. Sure was fun. Been having plenty of air raids at all hours of nite and early morn. Recon plane flies over with motor sounds like an old washing machine. Nicknamed “Washboard Charly.” Sure is some feeling, always waiting for some thing, not knowing what. One minute we’re sitting here and not knowing if you’ll be alive the next. Hear rumors of us invading New Georgia Isle. Bet that will be one hornet’s nest. Mail is lousey, haven’t heard from home in over a week now. Thunder last night woke me up and, so help me, I thought we were being bombed by the Japs again.